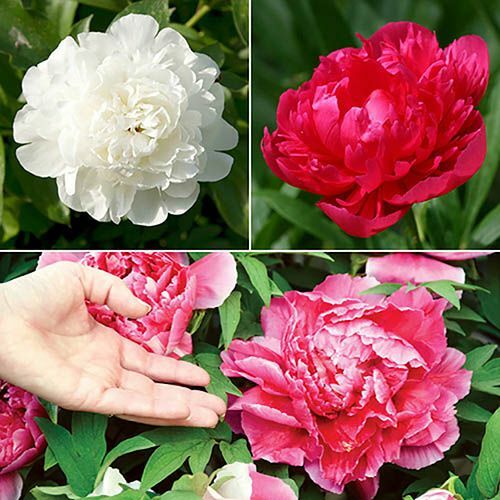 Now you too can have a gorgeous show of Peony flowers in your own garden! They'll add impact and vivid colour to your beds and borders from this year onwards. This collection includes 3 fabulous colours - crimson-red, shell-pink, and pure-white. They are easy to grow and low maintenance, ideal for beginners and those busy gardeners. Supplied as a pack of 3 bare-root plants, ready to plant. Producing a simply stunning display of their huge, blousy, double flowers throughout mid-summer; they’ll add impact and vivid colour to your beds and borders from this year onwards. For gorgeous fragrance and elegant beauty, they are almost impossible to beat! This collection includes 3 fabulous colours crimson-red, shell-pink, and pure-white they’ll look simply marvellous wherever you plant them. Peonies are very popular and it’s little wonder why as a perennial, they’ll come back year after year with bigger, better displays and all with the absolute minimum of effort! They are easy to grow and low maintenance, making them ideal for beginners and those of us with little time on our hands. They will die back after flowering each year, only to burst into life again the following spring. You’ll get bigger, better displays each year for many years to come. Perfect for growing in beds, borders, pots or containers.